You will enjoy a visit to this scenic Hill Country vineyard and winery located up in the hills just south of Comfort on the banks of Bruins Creek. 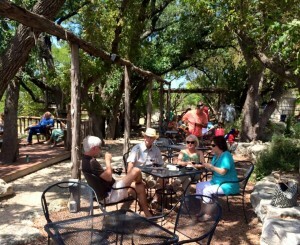 The tasting room, a rebuilt 100 year old Hill Country barn, greets you as you drive up to the winery. Park in the shade or tie your horse up to the old recycled wagon tailgate/sign out in front – and make yourself at home. A tour and tasting in this relaxed country atmosphere is sure to lower your stress level! Bring your picnic lunch and relax on the winery porch with a glass of award-winning Singing Water wine.